(CNN) -- Few people can forget the moment quake victim Anna Zizi, 69, was dragged from the rubble, singing at the top of her voice, her face caked in dirt and debris. Amidst the heartache and anguish brought by the devastating earthquake, music has proved a source of comfort for Haitians at home and abroad. Those living in France, in particular, say the sounds of kompa help bring their hearts closer to home and soothe their souls. 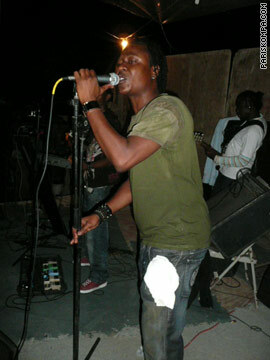 "For Haitian people, kompa music is like a cure. It helps us to forget stress and the bad times in life," said Original H, a popular Haitian kompa group in Paris, in a statement emailed to CNN. "Even in the saddest moments Haitian people always sing. Haitian people always laugh. Their hearts hurt, but they really want to continue to live," said Michel Marchand, presenter of "Kompa Boulevard," a program on France-based Radio Espace FM. Kompa musician Mikael Guirand of the celebrated band Carimi felt the power of his music first-hand. Guirand was in a meeting in the Digicel tower in Port-au-Prince, the country's tallest building, when the quake struck. He made it out unharmed, but his family's home and his father's business were both destroyed. Despite the overwhelming despair that followed, Guirand told CNN that devastated fans threw their arms around him in the streets, overjoyed to see musicians like him had survived. "To have people with no home crying to see that we made it alive is insane," Guirand said. "That shows how highly they value the music...it gives them hope." In France, kompa musicians are now rallying for their homeland and performing in charity concerts. "Since the tragedy we've participated in several events and projects to raise funds including 'A Gesture for Haiti'," said Original H. That event brought together leading French artists, including renowned singer Charles Aznavour, to produce a special song and music video. "Haitian music is honest, vibrant, and has things to say. It's the music of a people that has long suffered and still suffers." "We have all family and friends in Haiti, and most of us have lost someone. It is an unforgettable disaster and sometimes we feel helpless for our nation," Original H told CNN. Radio Espace and KompaParis.com, a Web site dedicated to kompa, are now helping lead the way organizing and promoting several festivals in France. In the days after the earthquake both groups also used their sites and broadcasts to help Haitians in France find family back home. The popularity of kompa music in France bodes well for the success of these upcoming events. Radio host Marchand thinks one of the key reasons is because of kompa's exuberant, live performances. "Kompa is very popular in France," he said. "It's because Haitian people play live music, not just in a studio, or to sell it on a shelf." Kompa music is considered an integral part of Haitian culture, first emerging on the Caribbean island about 60 years ago, distinguishing itself from the Dominican Republic's brand of merengue, both in spelling and in style. The Haitian meringue is nearly identical to the Dominican merengue but it is a slower tempo and is usually performed in a minor key. Fans describe it as a jazz derivative with pulsing beats, twisting rhythms and soulful Creole singing. "Kompa is a genre of Haitian music invented by saxophonist Jean-Baptiste Nemours, derived from the meringue and close to calypso," explained Vanessa Francklin of KompaParis.com. "Kompa wants to be open, warm and festive. [It has] bold brass, heavy bass, very inspired guitars, keyboards and percussion sounds with fire," she continued. "The music is honest, vibrant, and has things to say. This is the music of a people that has long suffered and still suffers," she finished. As Kompa's profile grows worldwide, many of its musicians are hoping it will not only now help raise funds, but cast Haiti in a more positive light. Bands are also writing special songs dedicated to disaster relief, including Tabou Combo, one of the more famous kompa bands in Haiti, their new song is called "Haiti Will Never Die." "A lot of people are getting to know who we are as Haitians through our music," added Guirand. "We are not only miserable as you see on TV. Our music shows we are rich in culture."